Ida was Michael’s foil: blessed with a gentle good humour and an ability to see beyond the crisis. She was the steady ship in a stormy sea – peaceful, cheerful, kind, welcoming and generous. Each were loving, and greatly loved, parents; both led lives of service to the community. Ida Benson (nee Seward) was born to an exceptional family. Her father, Norman, an optometrist, was a keen photographer, a poet, and an adventurer. Her mother, Effie, a teacher, was the second of four sisters who co–founded what later became Mentone Girls Grammar School. Ida was the youngest of five children, three of whom, Ida, David, and Winsome, studied medicine at Melbourne University. She grew up with her cousin, Lindsay Thompson, who later became Premier of Victoria. Michael Benson was the only child of Tom, a banker and a Gallipoli veteran, and his wife Evelyn. Ida and Michael both started the medical course in 1936. Michael was awarded a blue for swimming. He rowed, boxed and sang in the choir. However, it was the time of the great depression, war was looming, and trenches were cut into University grounds. Michael remembered delivering babies as a young medical student. When the bell sounded he had to get to the house by any means possible, but always hoped that the District Nurse was there first. One night he was called to a destitute family in Fitzroy, with only one bed and one sheet. It was the mother’s twelfth pregnancy and she was only 28. Things progressed slowly, and at daybreak, Michael ventured out into the street. The children were playing with their only toy – a tightly rolled up newspaper bundle, with which the boys played ‘footy’. The family were on the dole and their father had had to ‘hump his bluey’, making one less mouth to feed. The baby – mouth number thirteen – arrived later that day. Ida and Michael graduated in 1941, and began work as junior residents at Bendigo Base hospital. They married in 1943 and their daughter Jane was born in 1944. During 1945 Michael worked at Fairfield treating patients with diphtheria, whooping cough, measles, typhoid fever and scarlet fever – he developed scarlet fever and tuberculosis himself, and was transferred to the Austin Hospital. Ida meanwhile did sessional work. She would push Jane in the pram to the Austin and wave to Michael up on the balcony. Over seven months he made a gradual recovery and came home. 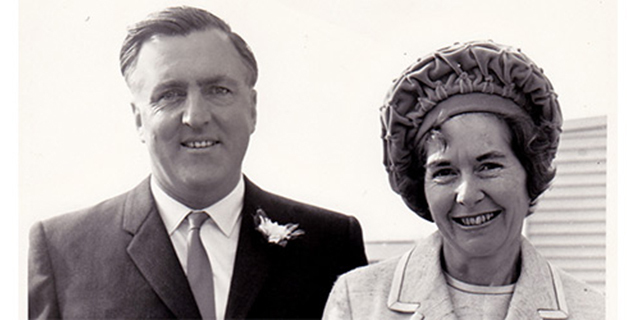 In 1947 Ida and Michael started work as general practitioners in Maldon. They were fully occupied. Ida did all the midwifery, so she had most of the night calls. Michael tried to look after the daytime surgery hours, and did most of the surgery. Ida gave the anaesthetics. They ran a small 30-bed hospital, and handled everything. Sometimes they were paid in rabbits and potatoes. In 1949 they moved to Mooroopna where Michael took up the position of Medical Superintendant at Mooroopna Base Hospital. Here, he was instrumental in the detection of a new virus that caused Murray Valley Encephalitis. Ida continued anaesthetics, and in 1953 became a member of the Australian Society of Anaesthetists. The family moved to Geelong in 1955, where Michael became superintendent of the Geelong Hospital, where they stayed for the rest of their lives. Michael went on to do radiology, and in 1969 moved into private practice. Ida worked as an Honorary Anaesthetist at the Geelong Hospital until 1979, and then in private practice. Ida and Michael had three more children, Robert, Simon and Tom. All three went on to study medicine at Melbourne University. Tragically, Tom developed cancer during his first year, becoming progressively more disabled each year. He died in 1977, on the first day of the final year exams. After Tom’s death, Ida and Michael established the Tom Benson Bursary at Melbourne University, which has since helped many disabled students. Robert and Simon have worked together as general practitioners in Footscray for over thirty years. Michael was physically imposing and intellectually astute. He enjoyed making speeches and loved an argument. He was energetic, and was impatient to get things done. During his time in Geelong, Michael served on the Geelong Ambulance Committee for 23 years, was a Shire Councillor, served on the Diocesan Council of the Anglican Church, and continued his love of choral singing.